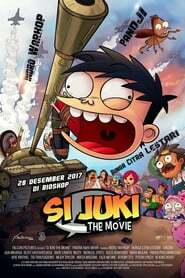 Sinopsis : Si Juki is a celebrity who is at the peak of his fame. His innocent, humorous, and courageous attitude makes him loved by everyone. Until a mistake made him turn into the number one enemy of society. At the same time a meteor falls threatening to destroy Indonesia. When Erin, a talented young scientist asks Juki for help to stop the meteors, can Juki save Indonesia?